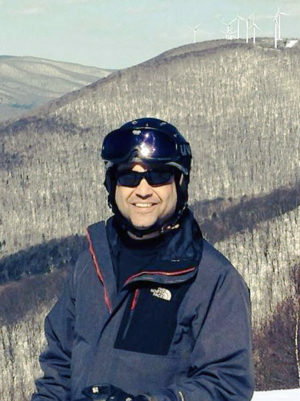 Jack Ruderman skiing at Jiminy Peak in Massachusetts. Jack Ruderman joins ReVision Energy to lead our Community Solar Initiatives, an ambitious effort to solarize municipalities, nonprofits, and schools throughout the Granite State, as well as organize the development of community solar farms. He previously served as Director of the Sustainable Energy Division of the New Hampshire Public Utilities Commission, where he was responsible for administering the state’s Renewable Energy Fund. Trained as a lawyer, he practiced criminal law for six years, and then joined the staff of New Hampshire’s Office of Energy and Planning. Over the course of twelve years there, he served as a Program Manager, Director of Renewable Energy and Efficiency Programs, Deputy Director and Acting Director. He holds a B.A. in political science from Tufts University and a J.D. from Northeastern University School of Law.